The aircraft industry needs a fast non-destructive technique to reduce inspection times. The eddy current array seems to be a good approach for many different components, like wheels and engine dovetails. 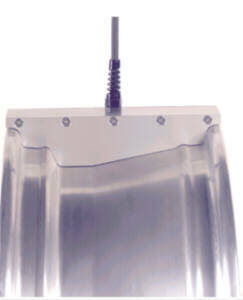 The array increases the area inspected but keeps the high resolution of a conventional eddy current probe. The array can also be shaped to follow the profile of the part. Each coil in the probe can be used in a different mode, like absolute, differential or transmit-received. It is possible to use eddy current array technology virtually everywhere conventional eddy current probes are used and improve the inspection speed. Today's technology can help to improve the inspection time by a large factor. 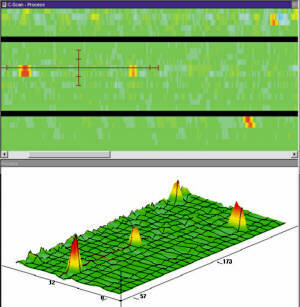 Multiplexers can be used with an array of coils to scan a large surface with the sensitivity of a pencil probe. The data coming from each coil is saved individually, so all the information is accessible as if it were coming from different drivers. The array can be used in different configurations, impedance or transmit-received in absolute or differential mode or a combination of the above. 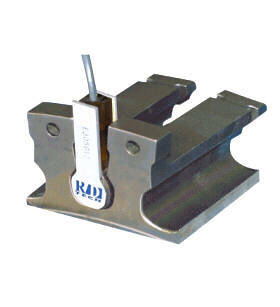 The array can also be manufactured to fit almost any shape or profile. The eddy current array is composed of three (3) different elements: the driver unit, the probe itself and a multiplexing unit. The big problem with multiple eddy current elements is the magnetic coupling (cross talk) between the coils. The multiplexing unit eliminates this difficulty. The figure 1 gives an example of what a pattern can look like. With the speed of today's electronics, this pattern can be repeated more than 1600 times each second. On top of that, the system is still capable of doing multifrequency inspection and can handle absolute and/or differential in a transmit-received and/or impedance mode. Fig 1: Drawing of an array probe. Four coils are read at one time, then four others and so on until all the coils have been read and a new cycle is started. The number represents the active coils at time 1, 2, 3 and 4. Some good examples of applications where the eddy current array could be used can be found in the aerospace domain. Wheel inspection is a very time consuming action. An inspection can take up to 20 minutes for a large wheel, but with an eddy current array, the same inspection just take a couple of minutes. Figure 2 shows the probe and an example of a real defect found on an automobile alloy wheel. The probe is composed of 127 channels. The size of the natural defect is approximately 15mm long and almost 100% deep. Fig 2: Wheel probe and example of data obtained with it. The dovetail inspection is another good example. Normally, this inspection needs a very complex robotic to push the probe along the shape of the dovetail and to keep the lift-off of the probe constant. Since the array already has the shape of the part, there is no need for a complex robotic. The probe just needs to be pushed along one axis and the other axis is simulated by the array itself. There is also the big inspection time gain; it can be reduced to less than a minute. The probe and the sample and the result are represented in figure 3. The sizes of the defects are 0,8 x 0,4 x 0,1 mm, except for the one in the middle, which is just 0,2 mm deep (half deep as the others). The inspection time is less than 5 seconds for a complete dovetail. Fig 3: Dovetail probe and example of data obtained with it. The two black lines show the three zones that are inspected. 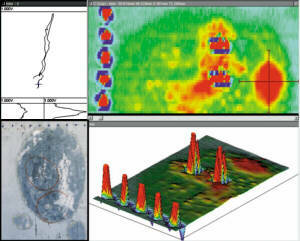 Corrosion mapping is another application that demonstrates the capability of the eddy current array probe. Having to scan a large surface on an airplane fuselage is not always easy because a lot of scanners are big and it's not easy to attach them to the surface. 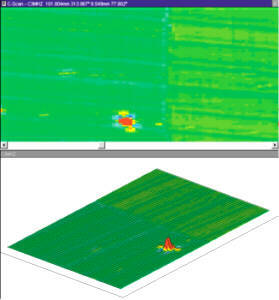 With the array, we don't need a scanner; we just have to push the probe along the surface. Figure 4. shows the probe and some results obtained with the array. 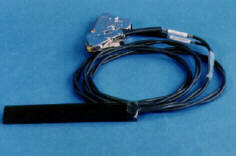 A feature of this probe is its flexibility. This probe can manage the changes in the curvature of the fuselage and keep the lift-off constant all over the inspection. Fig 4: The probe is a transmit/received design in a flexible casing. The right section represents the aluminium test plates with circular defects 10 to 5 mm in diameter and 40 to 5% deep. 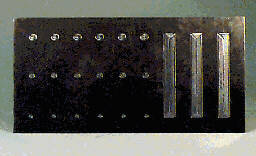 The lower left section represents data coming from real corrosion on an aluminium plate. It can be seen at the top left corner of the picture. 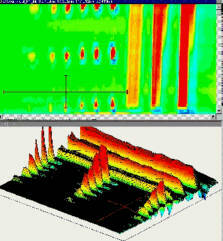 The eddy current array probe can solve a lot of problems where speed and accuracy are needed. It can be used on complex geometry's without the need of a complex robotic. The C-Scan displays ease the interpretation. Since it is an eddy current technology, the surface preparation is minimal and inspection can be done without direct contact, or any liquid coupling or penetrant.